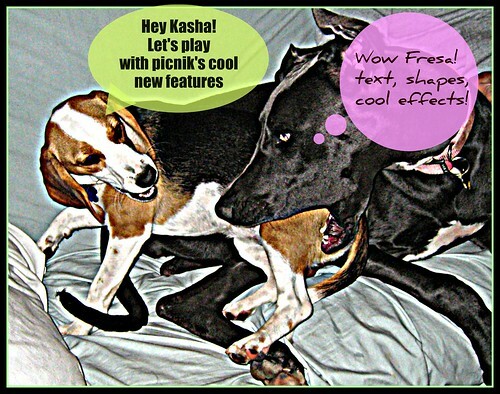 Fresa and Kasha are rather excited about the new features in picnik, the free online photo editor that lets you modify images from flickr, facebook, photobucket, your desktop, and then save back to these sites. The new tools allow text and shape overlays, new color effects, and more. Some of these are tools that are going to be part of their premium package (US$24.95 per year), but this week, for the launch, they are all free. One of the Small Precious Web Gems I plan to tout for my workshops is picnik, a web app for editing and adding effects to photos. I had a small chance to participate in the beta that led to this week’s public release of the full version. It’s not exactly Photoshop in a browser (though photoflexer comes close), but picnik has a very clean and easy to use interface. I use it directly linked to my flickr account, so I can pull pictures from there, add effects, frames, text, and then save back to flickr as a new photo. I also use it to clean up the often poorly exposed photos from my lame Motorolo camera phone (about 2 years old) – the picnik “one click fix” tool often boost the color end exposure to a much richer tone. It has a rotate and straighten tool that works exactly as the ones i use often in iPhoto. But to me, the real gain, and why this might be useful for educators, is the ability to add text, or even annotate photos. Actually I had hope to run a workshop on how to create the stunning kind of image / word /caption sets that LynnetteR posts in her Interesting Snippets collection. This are powerful one screen messages composed of a compelling or metaphorical photo, which she overlays with text, and than rounds it out as a solid piece of media with a caption contains a few paragraphs of written text, much of it citing resources that support the message. Until now, the web tools for adding text to images were less than simple to use, but picnik has changed all of that. I’m a fan of this tool, but am eager to hear what others think. How might you use a web based photo editor? What can you do by annotating existing images?